The Christian’s Armor: Christian, make sure your armor is on! There’s always a war going on in the heavenly places, and God has chosen us and is counting on us to engage the enemy. He has appointed us to overcome and cast down the principalities and powers through prayer; then to invade that evil kingdom and to rescue many lost souls. We do it usually through counseling and witnessing, along with prayer, but sometimes just with prayer. But first, before we engage the enemy, we must be prepared for the battle by making sure our armor is on. We can’t resist Satan without our armor. In fact, without it he will overcome us! And if Satan does overcome you, that is, if you have given into temptation, and you feel yourself sliding even further into sin, this is not the time to pray against Satan in trying to resist him. No, you cannot. Your only hope at this point is to repent of your sins and cry out to God for His mercy. Don’t read your Bible (not yet); don’t go to church (not yet); don’t do anything until you confess your sins. Then, when you have done that, begin to read your Bible and pray. And, as you do, you, in effect will be putting on your armor. I think many of us are not even aware of our sins; consequently, we go into battle without our armor. Then, surprisingly, at the end of the day, we find that we are all beat up and sliding even deeper into all kinds of lustful sins, fantasies, and greediness. Some of us think we are great servants of God; we have church titles; we go to prayer meetings and Bible studies; but all the while Satan is beating us up and dragging us down. Why is that? It is because we have neglected to confess our sins when they first come to us. Then we let Satan deceive us into practicing more sin. And so we find that we are in a defenseless and hopeless situation—because we are without our armor. I think that periodically we should check to see if we have our armor on—to see if we are right with God and prepared for battle. Ask Him to help you see whether you have sinned or not, and whether you are outfitted with His strength and protection. 1. You lack passion for holiness and purity. You are watching things on TV that you shouldn’t watch. You let enter into your mind things that are impure, and you don’t seem to care. 2. When you are faced with two things to look at, two things to think about—lustful things or pure things, sinful things or righteous things—you think and ponder the choice too long. That long, pondering choice is sin. The choice for God should be instant and with zeal. Thus you are lacking His righteous Spirit. 3. You are not angry at sin and zealous for the Lord. This entry was posted in Prayer A to Z Excerpts, Vigilance in Prayer, Prayer Warfare and tagged confessing sins, prayer, Resisting Satan, Satan, spiritual warfare, the Christian's armor. Bookmark the permalink. 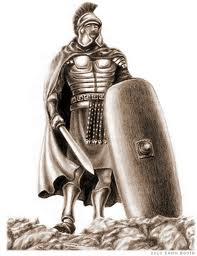 3 Responses to The Christian’s Armor: Christian, make sure your armor is on! I remember a time, several years ago, when I was going through an intense spiritual battle. One night, in bed, it was as though I could sense the forces of evil around me. I didn’t know how to make it go away. I wasn’t sure how to fight it. Then I remembered the passage about the armor of God. I went through each piece and thought about what it actually meant. I claimed my salvation, my imputed righteousness, I claimed it as truth and I used the faith to ward off the enemy. And then the oppression was gone. Just like that. Shouldn’t have been surprised when what God says will work, actually works hey! Thanks for sharing. I should do what you did more myself. It’s a good practice.